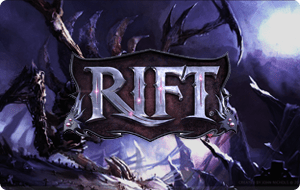 RIFT is a new MMORPG from Trion Worlds, where thousands of players adventure together to save a world being torn apart by magical rifts that unleash deadly planar invasions. Yes, RIFT is a massively multiplayer online role-playing game (MMORPG) set in a unique fantasy world. What are the system requirements for RIFT? Is a monthly subscription required? Yes. You can purchase your 30 day or 60 day pre-paid Rift game cards right here! What languages does RIFT support? RIFT supports English, French, and German. Is RIFT available to purchase as a digital download? Yes. RIFT is available at the Trion Store as well as from other partners. You can visit the Product Page to make your purchase or find a local retailer. What races can I play in RIFT? You can choose from many different races to adventure as in the world of Telara, ranging from the fierce Bahmi to the bold Mathosians. For more information on the people of Telara, visit the Races page. You begin the game by choosing one of four callings (Warrior, Cleric, Rogue, or Mage) and then build your perfect class using the Ascended Soul system. For more information, check out the Classes & Callings page. Is there Player vs. Player combat in RIFT? RIFT offers many forms and fashions of Player vs. Player (PvP) combat. Head to the PvP page for more details. Does RIFT offer crafting and/or trade skills? RIFT features a robust and comprehensive crafting and gathering system. Are there guilds in RIFT? Absolutely. RIFT offers a comprehensive guild system that is accessible to player organizations both large and small. Yes. The world of Telara is divided politically between two major factions: the Guardians and the Defiant. Both factions seek to save the world from planar destruction, but in very different ways. The factions are engaged in open conflict, and battle frequently, so no cross-faction groups or guilds can exist in RIFT. For more information on the Guardians and the Defiant, please visit our Player Factions pages. Can I move from a PvP shard to a PvE shard or vice-versa? Everything except for items left in your mailbox, at the Auction House, and in your Guild Bank will be transferred with your character. Will these transfers always be free for everyone? For the foreseeable future – yes! We feel this feature will add a unique way to play RIFT and look forward to seeing how it goes! Does my previous subscription time count toward rewards? I left for a few months and just came back. Does the time away from the game count toward rewards? No. Only the time you spend as an active subscriber counts toward Veteran Rewards. Do all characters on my account get the rewards, or do I have to choose one character? All characters on your account get the rewards. I pre-purchased the Standard Edition (or received it free when purchasing a year of game time). Can I upgrade to the Infinity Edition? Yes! Upgrade to the Storm Legion Infinity Edition to receive digital collector’s items: Brevanic Portal Generator, Cyclone mount, and Mini Regulos! What languages will be supported at launch by Trion? RIFT: Storm Legion will launch in English, French, and German. Do I need to own RIFT to play Storm Legion? Yes, you must own the original game to play the expansion. New players can get the full Storm Legion expansion in addition to the base game and 30 days of game time for just $ 49.99 . What are the minimum system specs for Storm Legion?